Time to Make Peace with the V6? Back in 1970 things looked great. The muscle car craze, which the 1964 GTO started, was in full swing. For 1970 horsepower and displacement were up, and there was a muscle car to fit everyone’s taste from all the different auto manufacturers. Unfortunately high insurance costs and legislative action were catching up with the muscle car. The low-performance era was right around the corner, and by 1975 performance in most cars would die. Since its first model year -1965, the Chevelle SS had grown in popularity. By the late-1960s, the Chevelle SS with its strong faithful following was one of the more popular muscle cars. 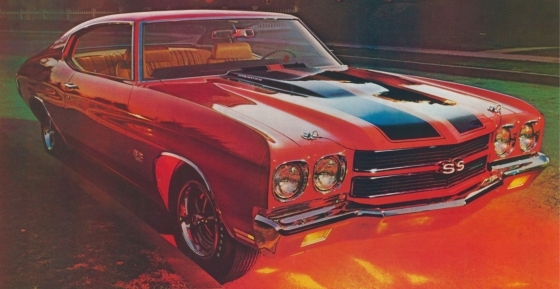 For 1970 even better things were in store for the Chevelle SS. Due to an internal edict at GM, only full-size cars and the Corvette could have engines with displacements larger than 400 cubic inches. Because of the edict the 1965 to 1969 Chevelle SS only came equipped with a 396 CID big-block V8. However by the late-1960s Chevrolet did get around this edict by allowing its Central Office Production Order (COPO) program to offer its full range of big-block 427 CID V8s (including the L88) to customers who special ordered COPO Camaros, Chevelles, and Novas. Though COPO allowed the production of some legendary 427 powered Chevrolet muscle cars, total production was very low. Only a few in-the-know racers and performance dealers such as Yenko used this program to get around the GM edict. GM decided to lift the edict for the 1970 model year, and Chevrolet’s response was the introduction of the 454 CID V8 as a 1970 Chevelle SS option. The 454 V8 is a member of the Chevrolet Mark IV big block V8 engine family. The first Mark IV engine was the 396 V8, which first saw duty during the 1965 model year. In 1966 the Mark IV 427 V8 joined Chevrolet’s engine lineup alongside the 396. 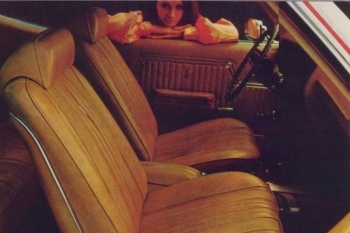 For 1970, the 454 was not only new to the Chevelle SS but also to Chevrolet. The legendary 427 big block V8 was the largest displacement Chevy V8 in 1969. For 1970, Chevrolet decided to increase the 427’s stroke, which increased the displacement to 454 cubic inches. The 4.25 in. bore and 4.0 in. stroke of the 454 are numbers that bring a smile to any muscle car fan’s face. Chevy fans at the time cheered the increase in displacement since larger displacement meant more horsepower and more torque. Chevy provided two separate SS options for the 1970 Chevelle, the (Z25) SS 396 option and the (Z15) SS 454 option. With the SS 396 option one could chose from two Mark IV 396 CID V8s – the L34 (350 horsepower) and the L78 (375 horsepower). Chevy’s little secret concerning the 396 for 1970 was that it no longer displaced 396 cubic inches but rather 402. Chevy added a .030 in. overbore on the 396 block pushing its displacement up to 402 cubic inches. For some unknown reason Chevy decided it was best to call the 1970 402, a 396. The SS 454 or Z15, a mid year option, gave the 1970 Chevelle SS buyer two powerhouse 454 V8s to choose from – the LS5 and LS6. The LS5 454 was rated at 360 horsepower in the 1970 Chevelle SS, but 390 horsepower in the 1970 Corvette. The reality is that the LS5 in the 1970 Chevelle SS is identical to the 1970 Corvette’s LS5. What we have here is a classic case of Chevrolet fudging horsepower figures. The 1970 Corvette was slated to have a 465 horsepower LS7 454 as its top engine option, however Chevy changed its mind and cancelled the LS7 before it was produced. The 1970 Corvette was then stuck with the LS5 as its top engine option. The LS6 with its 11.25:1 compression ratio was factory rated by Chevy at 450 horsepower and a whopping 500 lbs/ft of torque. Helping to make this impressive power were solid valve lifters, a forged steel crank, TRW forged aluminum pistons, forged connecting rods, an aluminum intake manifold, and an 800 cfm Holley 4bbl carburetor. Getting the power to the wheels was the job of two available transmissions, a Muncie M22 “rock-crusher” 4-speed manual transmission and a 3-speed TH400 automatic transmission. A few different performance rear axle options were available for the 1970 Chevelle SS LS6, the most performance oriented being a posi-traction 4.10 geared rear axle. On paper the LS6 was the most powerful production engine during the muscle car golden era. The Chevelle SS LS6 consistently obtained 13 second range 1/4 mile times in magazine tests back in the day, which is extremely impressive when you consider a LS6 Chevelle SS has a weight of around 4,000 lbs with driver and fuel. The fastest LS6 1/4 mile time recorded by an auto magazine (back in the day) was in the November 1969 issue of Car Craft magazine. Car Craft rocketed the bone stock 1970 Chevelle SS LS6 through the 1/4 mile in 13.12 seconds at 107.01 mph. The 1970 Chevelle SS LS6 was also no slouch around the turns with its heavy duty F41 suspension which not only included heavy duty suspension components but also 14×7 inch wheels and F70x14 tires. Even though it was a mid year option, the pricey 1970 Chevelle SS LS6 454 sold pretty well for a low production car, with 4,475 units sold (this was out of a total of 62,372 1970 Chevelle SSs produced). 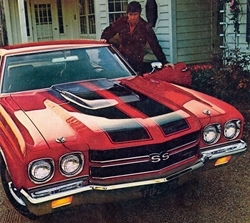 Helping sales was the stylish new look of the Chevelle SS for 1970. It was essentially a carryover Chevelle bodystyle that was first released for 1968, but did have a new front and rear end design. The new front and rear styling provided a very muscular look that matched the performance under the hood. Even the chrome tipped dual exhaust added to the style of the 1970 Chevelle SS. The 1970 Chevelle SS 454 could be ordered in two body styles – the 2-door coupe and convertible. The real news for the 1970 Chevelle SS, was the new optional “cowl induction” hood (ZL2), which had a solenoid-operated flap that opened to provide cool air for the carburetor via the air cleaner assembly. By 1970 most muscle cars were leaving the dealer lots loaded with many factory options, a far cry from the stripper muscle cars of a few years prior. The Chevelle SS LS6 with its many available options was no different. It was not cheap, it started at around $4,500 and the price increased as more options were added. Back in 1970 the average family income was around $10,000, making a Chevelle SS LS6 454 an expensive purchase for the average buyer however it was worth every penny. The LS6 454 returned again in 1971 but it was only available in the Corvette where it produced 425 horsepower. The horsepower loss was due to a loss in compression. All GM engines in 1971 suffered a substantial compression ratio drop in order to meet new federally mandated unleaded fuel standards. The party was now over, and the new race for auto manufacturers was to see how fast high performance engines could be detuned or eliminated. After 1971, the LS6 454 left and never returned. And soon after, the 1973 Chevelle SS became the last Chevelle to wear the SS emblems. Every once in a great while a freak of nature occurs, something so different from the average or norm that it blatantly stands out. 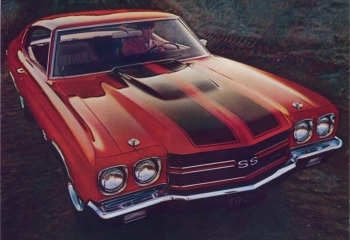 In 1970 the Chevelle SS LS6 was just that – a freak of nature. It was the complete apex of an era of skyrocketing horsepower ratings when it seemed like the sky was the limit. Looking back now, it’s quite clear the 1970 Chevelle SS LS6 was the Mount Everest of the muscle car golden era.